Carly Fiorina has a new favorite punchline to slam President Obama. 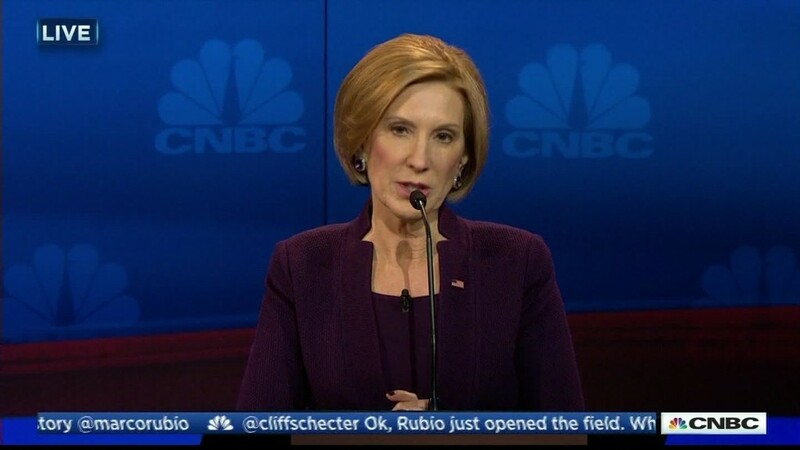 Lately, Fiorina likes to say: "92% of the jobs lost during Barack Obama's first term belonged to women." She said it Thursday morning on CNN. She said it Wednesday night at the debate, and she wrote it in an op-ed published in the Wall Street Journal earlier this week. On the wrong-o-meter, this gets a 10 out of 10. There were actually more women working at the end of Obama's first term than when he started. January 2009: There were 66.5 million American women working in non-farm jobs. January 2013: There were 66.9 million. That's an increase of over 400,000 working females in Obama's first term. So where did Fiorina come up with this statistic? It's an old figure pulled from the failed Mitt Romney 2012 playbook. At that time, many factchecking groups, including the Washington Post and Politifact, debunked the claim. The only way to get a number that's close to what she says is to pick odd start and end dates such as starting in January 2009 and ending in March 2012. That's very arbitrary, and it certainly doesn't cover Obama's entire first term. The Romney campaign stopped using that statistic because the facts changed. Hiring started picking up in 2012. It's also widely known that men lost more jobs overall during the Great Recession and have had a harder time getting back to work than women. This is because there were more layoffs in male-dominated industries such as manufacturing and construction. Overall, men lost about 6 million jobs while American women had shed about 2.7 million jobs at the worst of the downturn. Fiorina -- and other GOP candidates -- have been making many valid critiques of the Obama economy, but this particular one about "the 92%" doesn't hold up to scrutiny.